Lotteries,held on the 14th June 2007. You are to receive â1,000,000.00 (One Million Euros). fully remitted to you by our accredited pay-point bank. forestall the abuse of this program by other participants. around the world through our Internet based ballot system. 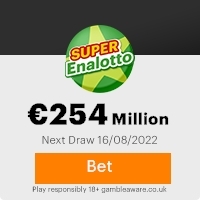 next draws; the Jackpot winning is 2, million Euros. included in the next sweepstake. This Email with the Subject "2007 Award winner...," was received in one of Scamdex's honeypot email accounts on Sat, 14 Jul 2007 08:22:19 -0700 and has been classified as a Generic Scam Email. The sender shows as "winningr@terra.es" <winningr@terra.es>, although that address was probably spoofed. We recommend that you do not attempt to contact any persons or organizations referenced in this email, as you may expose yourself to scammers and, at the very least, you will be added to their email address lists for spam purposes.